School children, everyday commuters and sight-seeing tourists – everybody using public transport has the expectation of safe travel, and passengers rely on transport companies and authorities to have appropriate safety provisions in place. Following recent media reports of a bus fire on Oxford Street in Sydney and a tourist bus fire on Queensland’s Fraser Island, vehicle fire protection is once again a popular topic of conversation. For vehicle managers, fire safety can pose unique and specific challenges. Many buses and large vehicles have fuel sources and other combustible components that can be in relatively close proximity to the vehicle’s ignition and heat sources, all of which surround the vehicle’s driver and passengers. Vehicle fires can occur for many reasons. For example, according to reports the NSW Office of Transport Safety Investigations believes the Oxford Street bus fire was the result of a cracked pipe which was leaking fuel. 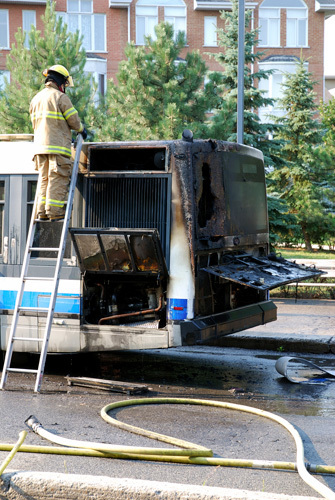 Last year, after several school bus fires Wormald called for bus companies and transit authorities to not only install up-to-date vehicle fire suppression systems and fire protection equipment, but for the vehicle fire suppression systems to be compliant with Australian Standard, AS 5062-2006: Fire protection for mobile and transportable equipment. We will continue to highlight the need for fire suppression systems to be installed on every vehicle so that drivers and their passengers are offered a higher level of protection. For those who are not familiar with the solution, a vehicle fire suppression system is designed and installed to specifically target the areas within a bus or vehicle that are most vulnerable to a fire occurring, for example in a vehicle’s engine compartments. The system detects when a fire has ignited, providing early warning to maximise the available time for occupants to evacuate the bus or vehicle. At the same time, the system also automatically activates to suppress the fire to help minimise damage to vehicle. AS 5062-2006 should be recognised as best Australian industry practice. It is important for those responsible for vehicle management to be aware of the Standard as it specifies the minimum requirements for the design, installation, commissioning and maintenance of vehicle fire suppression systems. The Standard also promotes thorough processes for risk analysis and assessment as a prerequisite. This helps determine the areas of the vehicle with greatest fire risk so that the most appropriate fire protection solution can be provided. Another important element of AS 5062-2006 is the requirement for regular inspection, testing, preventative maintenance and survey procedures for vehicle fire suppression systems. Regular inspection and testing helps to ensure that the systems are fully functional and will perform as designed when required. Most vehicle fire suppression systems have both automatic and manual activation options. Bus drivers and other vehicle operators should be fully trained on how to manually activate the systems so they can quickly respond in a fire emergency. They should also be trained on how to operate any other fire protection equipment which may be located in their vehicles, such as portable fire extinguishers. To be fully prepared, and to give passengers peace of mind, I would encourage vehicle operators, transport companies and transit authorities to review the fire safety solution on their vehicles and ensure their staff and passengers are offered the highest level of fire protection. This entry was posted in Vehicle fire suppression and tagged bus fire safety, bus fires, vehicle fire protection by wormaldblog. Bookmark the permalink.